Struggling to Streamline your Manufacturing Process? Home Struggling to Streamline your Manufacturing Process? Every business has its unique selling proposition, which acts as a differentiator for the enterprises. In order to succeed in the competitive business environment, you need to keep innovating your approach, and align your system to your business needs in order to streamline the different operations and increase efficiency. By combining innovative approach with your USP, you gain an edge over your competition. If you are in the manufacturing business, you would understand the value of efficient scheduling, seamless operations, capacity planning, optimum utilization of resources and a channelled delivery system. But is it possible to take care of all these without an efficient system? With appropriate SAP Business One Custom Solution, businesses in the manufacturing sector can create a fast-paced environment that deals with sudden schedule changes, without disrupting the manufacturing unit. 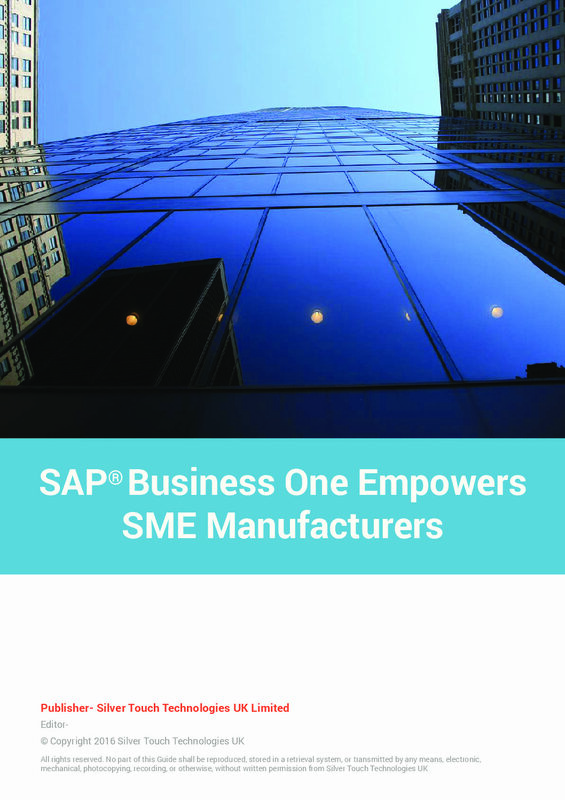 There are several ways in which SAP Business One for manufacturing industry builds a more efficient system. Not only does your planning time get reduced by half, but thanks to its responsive nature, you can also make changes on-demand basis. Thus you can make changes to SAP Business One during the initial implementation and also when the system is up and running. Material acquisition continues to be one of the most time consuming and complicated affair in the manufacturing industry. But with SAP B1’s Materials Requirement Planning (MRP), you can procure, schedule and manage materials easily. What’s more – you can also set the criteria for material acquisition according to your requirement. With the help of SAP Business One, you can thoroughly check on your stocks. You can keep a track not only on the stock but also on how to favourably use them before their expiry date. Thanks to efficient SAP, you can also ensure that no expired product stays behind and is dispatched at the right time. Tracking and recording stock, managing items, updating price list, price agreements etc. can all be effectively managed with the help of SAP Business One. It helps to maintain and manage stock data and keep a track on any product or material transfer between warehouses and manufacturing unit. In order to smoothly run the supply chain, it is important to manage it properly. This can be done by accurately managing available resources. SAP Business One helps you efficiently manage both your human and material resources to achieve maximum productivity. Manufacturing unit has to keep a minute-by-minute update on the production unit. In order to ensure that deliveries are made on time, they have to be efficiently managed. This can be easily done with the help of SAP Business One. Silver Touch Technologies offers highly capable SAP Business One Solutions that cater to your business needs. Call on +44 – (0) 203-872-5140 or email us at info@silvertouchtech.co.uk for a free SAP Business One Demo.